The Sports Illustrated Swimsuit Edition turned 50 this year. Can that even be possible? In fact, it is. SI (Sports Illustrated) started adding heat to the long dreary winter days and nights by shedding some tropical rays, and having pretty female models shed their clothes inside their magizine. German born Babette March became the first Sports Illustrated Swimsuit Cover Model on 1/20/1964, and had a 7 page spread in the magazine. Through the years SI both increased, and decreased coverage at the same time. Increasing coverage by going from a 7 to 13 page oasis of pictures in the middle of the issue to what it is today, an entire issue (2 and 3 times the number of pages) dedicated to beatuiful models in exotic lands and beaches. So if they increased coverage, how did they decrease it as well? The decrease came in “coverage” of the models themselves (I’m not complaining). 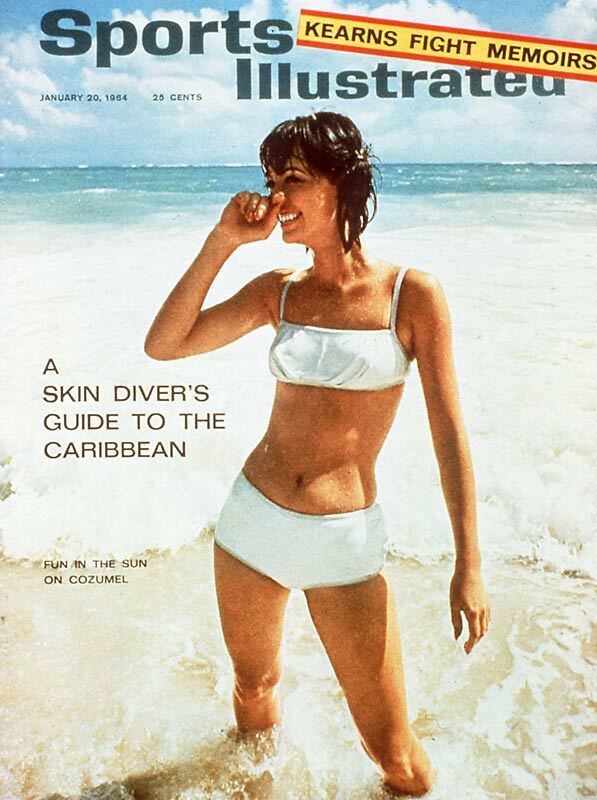 Originally there were one and two piece swimsuits, and that it’s self was ground breaking for a “Sports” periodical. As the years went by SI had to reinvent the wheel and found good use of such items as paint, palm leaves, flowers, and stratigically placed sand (if you know what I mean). Hell, Kate Upton defies GRAVITY this year! What will SI think of next? My first love came from the first SI Swimsuit Issue I recieved in the mail on that fateful February day in 1984. Paulina Porizkova graced the cover in a hot pink swimsuit that has burned an image in my memory ever since (Rick Ocasek that lucky SOB). Other swimsuit models who have also made enough of an impression that I remember their names: Kathy Ireland, Kim Alexis, Marisa Miller, and most recently Kate Upton. This entry was posted in sports, Uncategorized and tagged Babette March, Bikini, Kate Upton, Kathy IrelandSports Illustrated, Kim Alexis, Marisa Miller, Paulina Porizkova, Swimsuit. Bookmark the permalink. You picked out some nice ones. I would like to add Christie Brinkley, Kathy Ireland, Brooklyn Decker, & Stephanie Seymour. Yes…Christie Brinkley – “VACATION” Seymour and Decker are damn nice too! Make sure if you haven’t already go to my blog at http://www.thebig920.com (Jeff Miller Sports) and watch the 2014 video of this years beauties!